It’s Thanksgiving Day, 1931, in New York City. By early 1932, one in three city residents will be out of work. Roughly 1.6 million were on the relief rolls, according to the Lower East Side Tenement Museum. Down and out New Yorkers began building a Hooverville in Central Park. 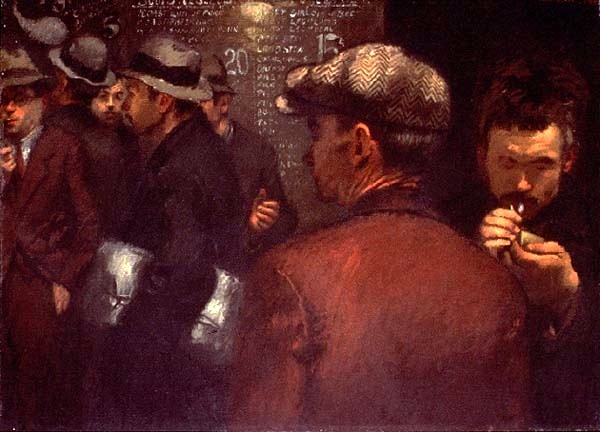 And an astounding 10,000 men waited for their turn to sit down to dinner at the Municipal Lodging House, the public city shelter for homeless men, women, and children at the foot of East 25th Street. This New York City Department of Records photo captured a group of these men in bulky overcoats and hats. They’re young and old, mostly oblivious to the camera and focused only on consuming their turkey and potatoes. Art Deco skyscrapers stand proud like shiny monuments across the Manhattan skyline. But Art Deco subway stations? Those are harder to find. 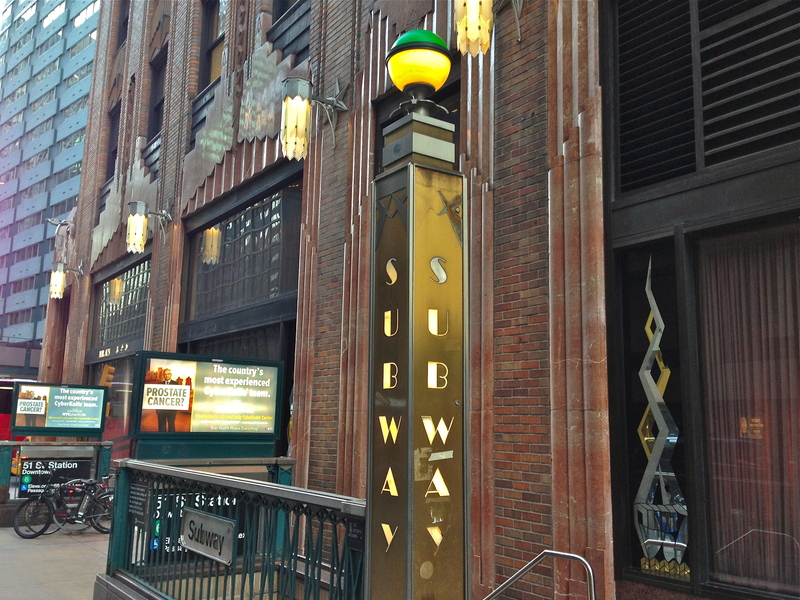 The lucky commuters who take the E or 6 train at Lexington Avenue and 51st Street get to pass this stylized Art Deco subway entrance. Thanks to the sleek design and surrounding buildings, it’s always the end of the Jazz Age. The sign is right outside the General Electric Building (formerly the RCA Victor Building) a 1931 Art Deco beauty, with its decorative bursts along the facade meant to represent the awesome power of radio waves and electricity. And that wonderful clock, with forearms that stretch time! 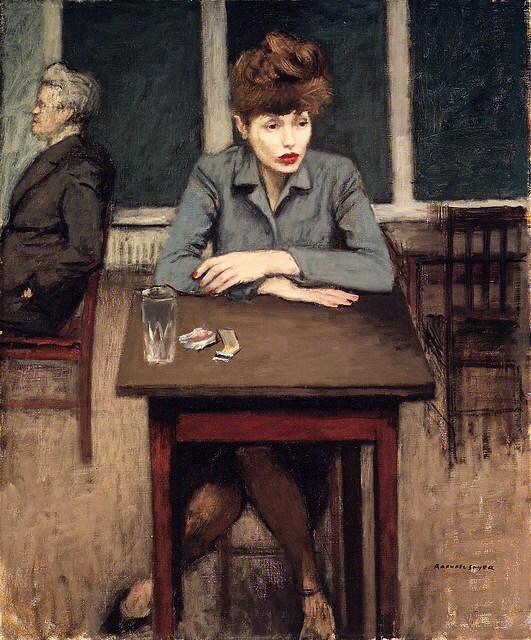 New York artist Raphael Soyer’s style of painting was seriously out of fashion during his lifetime. 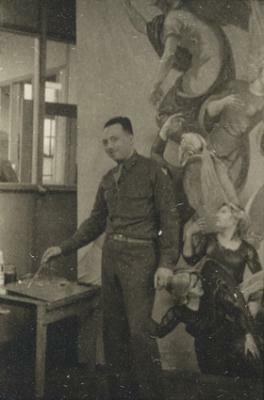 Born in Russia in 1899, his family arrived in the Bronx in 1912. 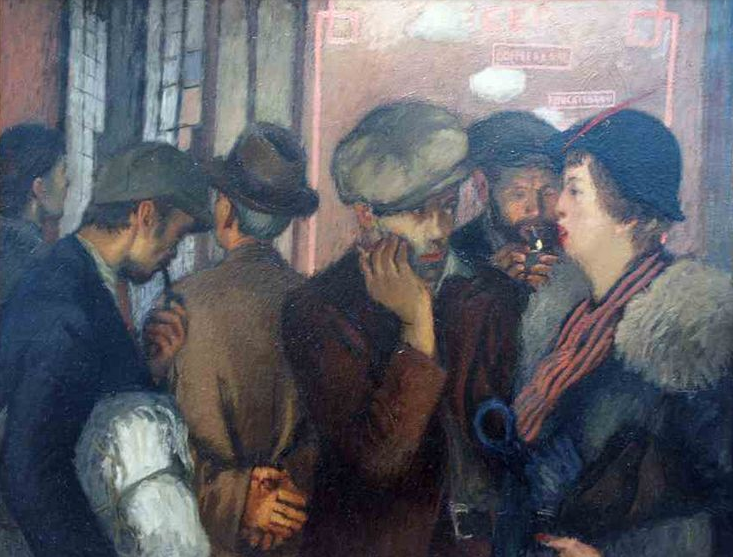 Soyer soon went to work, holding menial jobs. But throughout the teens, he also studied art, taking free classes at Cooper Union and the Art Students League. 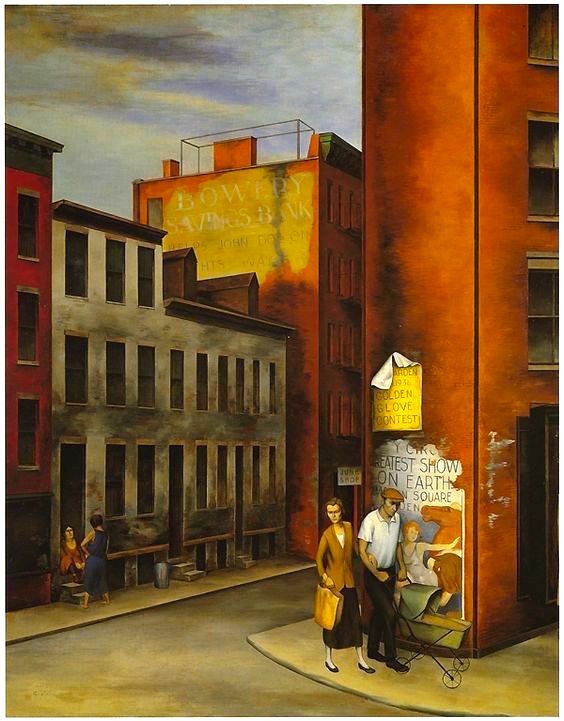 Rather than the abstract style that was popular in the 1930s and beyond, his work was realistic—he cast his eye on the lonely and downtrodden working-class New Yorkers he saw in bars, employment agencies, and on city streets. With his twin brother Moses and another sibling, Isaac, he was a leading Social Realist. 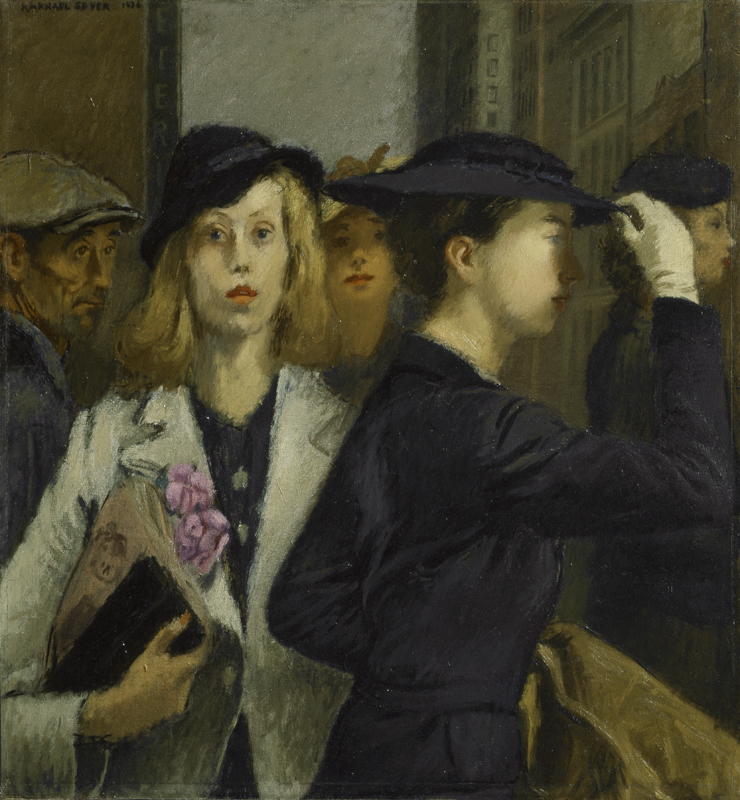 Soyer sketched and painted compassionate images of lonely and dispossessed Bowery bums, shopgirls, and secretaries going about their lives and appearing ordinary, unheroic, yet deeply human. You rarely consider the effort that went into building the typical unfashionable Manhattan side street. 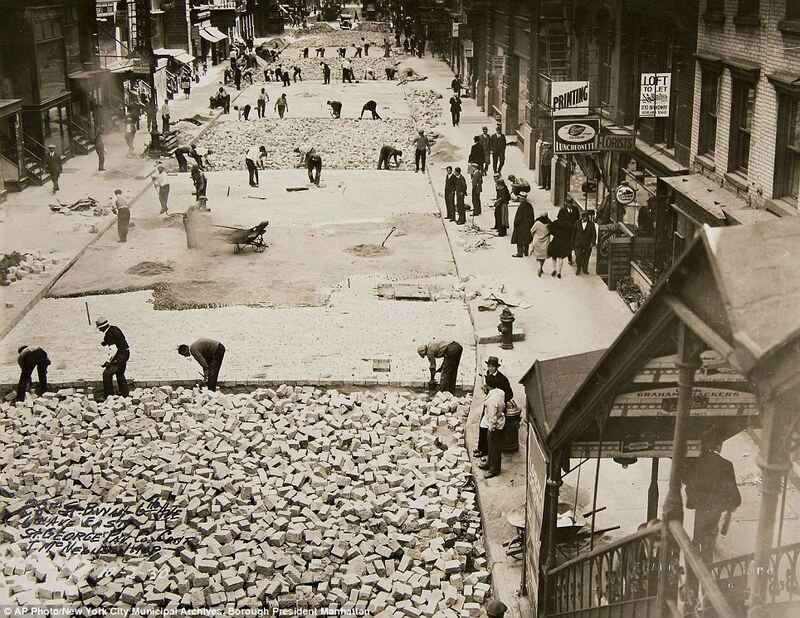 Laying those granite blocks looks like hard work, and there’s no equipment or machines in sight. It’s from the wonderful New York City Municipal Photo archive. Here’s another look at the street, the Sixth Avenue El Station, and the thousands of granite bricks waiting to be laid down. I love the ad inside the stairwell of the el station: graham crackers. Waiting for the subway to pull into the station can be a collective experience. 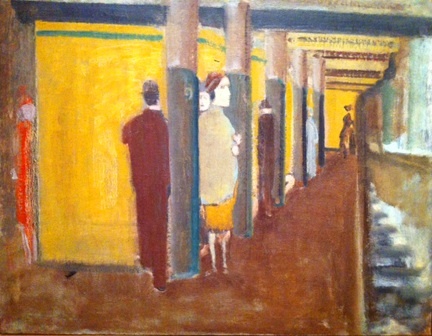 But not for the people in Mark Rothko’s Subway Series paintings. 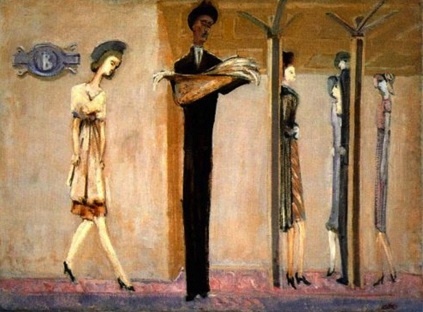 These figurative scenes, completed in the 1930s, depict isolated, Giacometti-esque New Yorkers who appear to be trapped in their own individual worlds. 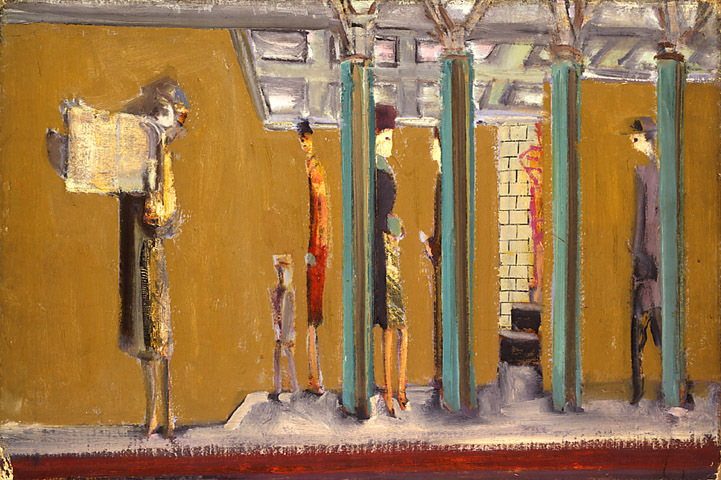 These subway paintings “enabled him to focus on the horizontals and verticals, treating the figures as tall, spindly, stick-like forms,” according to the caption accompanying one of the paintings on the website for the virtual Musée Historique Environment Urbain. Rothko, born in Russia and raised on the West Coast, moved to New York in the 1920s and soon began his career as a painter. Classified as an abstract expressionist, he spurned the label his entire life. 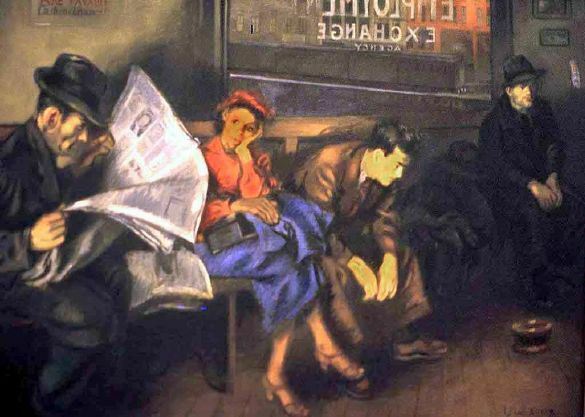 An earlier post on the most famous painting in the Subway Series. 1956 was a crucial year for seven-mile Third Avenue. 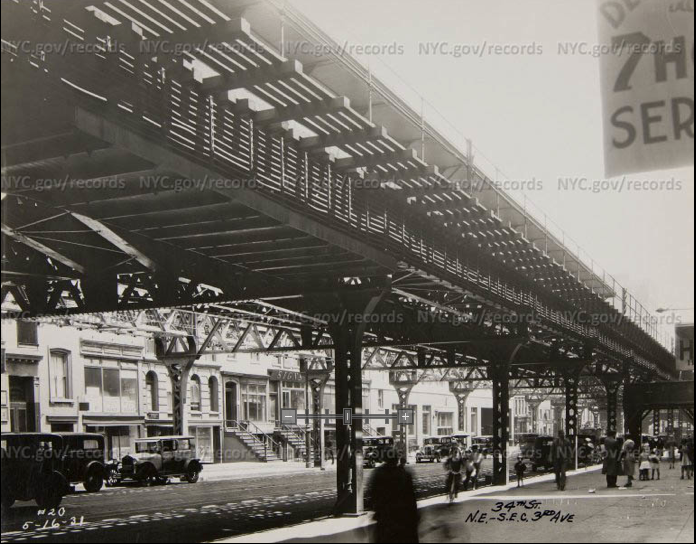 That’s when the last piece of steel from the Third Avenue El was dismantled (below at 34th Street in the 1930s), bringing sunlight and broad views to a thoroughfare long known for its shadows and grime. And right about when the El was finally removed, some residents and real estate officials called for Third Avenue to be given a more glamorous name. “[Borough President Hulan E. Jack] said that at least five new names had been suggested,” wrote The New York Times on February 17, after a ceremony marking the removal of a steel column. Among them were The Bouwerie, United Nations Avenue, International Boulevard, and Nathan Hale Boulevard (the Revolutionary War hero was reportedly hanged at today’s Third Avenue and 66th Street). “One atomic-minded New Yorker had offered Fission Avenue,” stated the Times. In the end, of course, Third Avenue remained Third Avenue . . . and the Bowery now connotes boutique hotels.